This small batch of Maple Scones is perfect for a last-minute brunch. 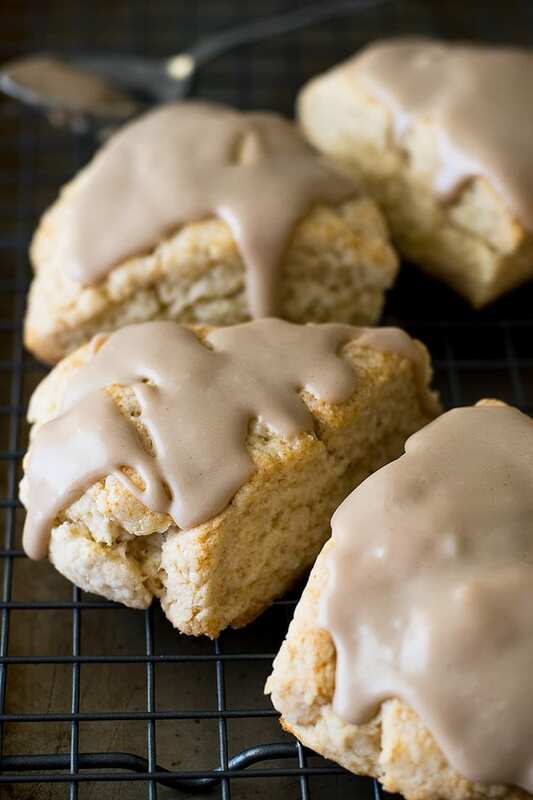 The cream scones are quick and easy to make, and you’ll want to eat this maple glaze with a spoon! It’s week two of Nerd Month, year 2 (What’s Nerd Month? Read more about it in my Potato Gratin for Two post) and today’s recipe is inspired by one of my favorite new comedies from 2016, The Good Place! Have you watched The Good Place? If you haven’t, you absolutely should. It’s sweet, incredibly funny, and very, very clever. If there’s been a bit of a hole in your heart since Parks and Rec left the air, this might be just the show you’re looking for. If you don’t know the premise of the show, it’s that Eleanore, a pretty terrible person in life, accidentally ends of in “the good place” when she dies. It’s clear to her right from the beginning that she doesn’t belong there and that her presence seems to be destabilizing heaven, so the show is mostly a series of wacky, heavenly hi-jinks and misadventures as Eleanore and the lovable weirdos she meets along the way try to keep her from being found out while the afterlife is going crazy around them. And it’s a damn delight. In the third episode, after the latest Eleanore-induced disaster, Eleanore and her bff/mortal enemy, the disgustingly perfect Tahani, go around their bit of heaven to deliver maple butter scones to all of their neighbors, and as soon as I heard the words “maple” “butter” and “scones,” I was intrigued. I mean, how good do maple butter scones sound!? Now, I’m not sure what combination of maple butter and/or maple and butter went into Tahani’s scones because when I went to go look up a maple butter scone recipe, I found none (seriously, go google them. I’ll wait.). And then I realized that it made perfect sense, because of course Tahani’s go-to scone recipe would be one-of-a-kind. Of course. And of course I then wanted to make her scones, so I did. My take on Tahani’s maple butter scones is a simple cream scone finished off with a fabulous maple (and) butter glaze. Cream scones are a bit different from classic scones like my Bacon Scones. They use cream in the dough rather than cold butter (some recipes use both) and the result is a scone that is on the moist side rather than crumbly with a slightly crispy exterior. They are also insanely easy to make. You just throw all the dry ingredients into a bowl, stir in the wet, and the next thing you know, you have a batch of scones ready to go into the oven. I cut my scones into wedges because I think they are cuter that way, but you can make them into rounds like Tahani if that’s more your style. Then once your scones come out of the oven and cool a bit, you drizzle on a simple and sweet maple butter glaze. This small batch of Maple Scones is perfect for a last-minute brunch. 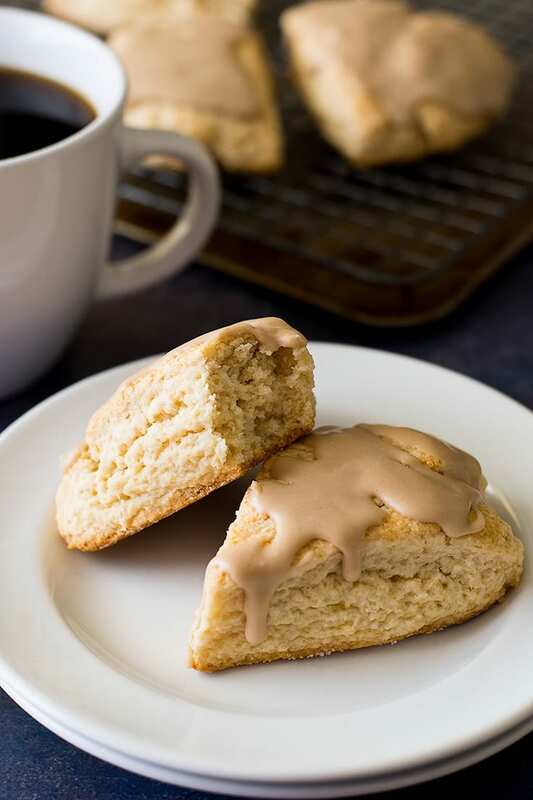 The cream scones are quick and easy to make, and you'll want to eat this maple glaze with a spoon! Preheat your oven to 425°F and line a baking sheet with parchment paper or silicone baking mat. In a large bowl, whisk together flour, baking powder, salt, and sugar. In a liquid measuring cup or bowl, stir together heavy cream and vanilla. Drizzle cream mixture over your dry ingredients and stir, using just enough cream so that a dry dough forms with no loose flour at the bottom of your bowl*. Use clean hands to finish mixing and shape dough into a ball. Turn out onto a lightly floured surface. Press dough out to a disk about 5 1/2-inches across or 3/4-inch thick. Use a dough scraper or knife to cut circle into 6 triangles. Transfer scones to your prepared baking sheet, arranging the wedges in a circle about 1-inch apart. 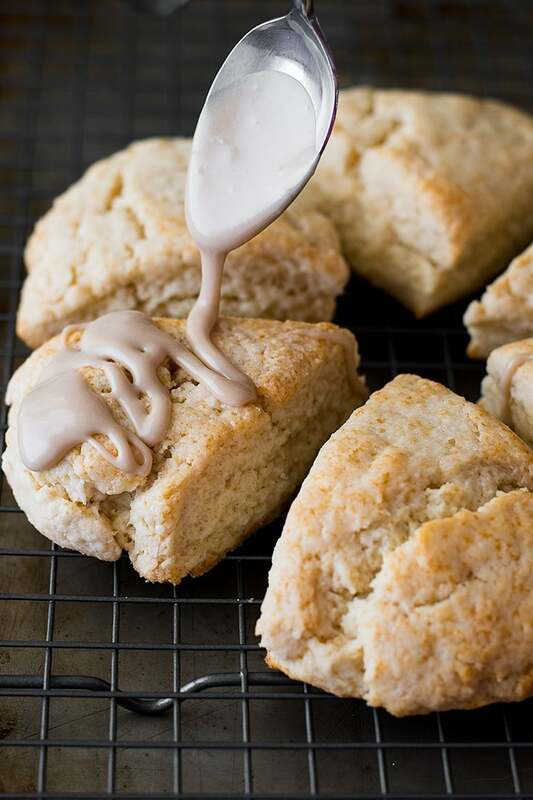 Brush the scones with a little cream to help them brown. Bake for 14 to 16 minutes, until scones are baked through and lightly golden brown. In a small bowl, whisk together powdered sugar, melted butter, 1 tablespoon of the milk, maple extract, and salt. Add milk by the 1/4 teaspoon until glaze reaches a drizzling consistency and drizzle over scones. Allow glaze to set for 5 minutes and enjoy! *If dough still seems too dry to come together, you can add just a bit more cream, but don't go overboard. Your dough should not be sticky! I haven’t heard of that show before, so thanks ago for another recommendation 😉 Scones are something that I love, but don’t make a lot of. These sound heavenly (couldn’t resist) and that maple glaze would probably taste good on just about anything! I’m going to have to whip these up soon, though I would love to have one in front of me right now and not just on my computer screen, lol. Pinned! Happy Monday, Tracy! Has anyone tried the glaze using Maple Syrup instead of the extract? Hi, Marianne. Replace the extract with 1/4 cup of maple syrup, and only add the milk (a little at a time) if the glaze is too thick. It will be a different consistency and have a milder maple flavor than the glaze shown, but should still taste delish. Just found this blog because I’m watching The Good Place right now and immediately Googled for the recipe! I want to make these soon! Thanks! Another person here because I googled while watching the show! Definitely making these at the first possible opportunity. THIS MAKES ME SO HAPPY!!! 😉 Hope you enjoy them, Tabby! Wondering if this glaze hardens? Hi, Sara. It doesn’t get hard hard, but it does set (like donut glaze). I just made these last night and I’m already in love with them! I’ve never made scones before so I was worried about how they would come out, especially since my dough seemed rather crumbly, but they turned out perfectly! I ended up using the entire 3/4 cup of cream for them. I used Club House maple extract which left a bit of an aftertaste, but it’s not too strong. I would definitely recommend investing in a high quality maple extract to make these, which is what I’ll do next time. I mean, who doesn’t want to feel like Tahani occasionally? 😉 I’m so happy you enjoyed them, and thanks for the maple tip. I totally agree! I want to take these to an Easter brunch. However, 6 isn’t enough. Do you think I could easily double (or triple) the recipe? Oh, these scones are amazing! I came across this recipe a couple weeks ago, and have made them at least 4 times so far. The glaze is super adaptable too; my favorite is substituting some of the powdered sugar for vanilla bean and adding almond extract instead of maple. Thank you for these delicious scones! This makes me so happy to hear, Lindsay! And I love the idea of making an almond glaze. Totally trying that next time I make these! That is so funny, I was watching the show on Netflix and thought those scones sounded amazing! That is how I found your recipe. Can’t wait to try it! OMG, you are amazing. Can’t wait for the premiere, and hope everyone enjoys the scones! Can I use milk in place of the cream? Hi, Sara, I’ve never made these with milk. Without further recipe testing, I couldn’t say for sure. Sorry! These are so good and easy! Every time I have tried making scones in the past they were hard and could have been used as weapons! I’ve made three batches to give for the holidays and they return out perfectly. Has anyone come up with any variations? Lol! I have totally made batches of scones in the past that could do some damage as projectile weapons. Glad these turned out for you. One variation I like is to omit the glaze, sprinkle them with crunchy sugar before baking and eat them warm with butter and jam. You could also add some lemon or orange zest and do a citrus glaze like the ones in these muffins: https://bakingmischief.com/2017/07/28/small-batch-orange-muffins/ or add some chocolate chips to the batter. 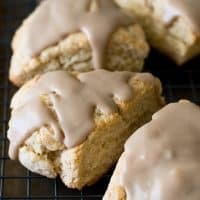 Absolutely the best and easiest scone recipe I have tried. I used whole wheat pastry flour (grabbed it by accident) and baked them for about 15 minutes and they turned out terrific. Also made the divine frosting and sprinkled finely chopped walnuts on top before the frosting set. Thank you SO much for this fabulous recipe !